For many centuries sheep have been washed in the early summer, a few weeks before shearing, to clean the fleece of the dirt, grit and grease which inevitably build up over the winter months. It should not be confused with sheep dipping which is a more recent practice aimed at controlling parasitic infestation. Sheep washing at Priory Farm, Thurgarton in the 1940s. This is the hard way to wash a sheep, but then there is no easy method for sheep washing has always been extremely laborious and wet for both animal and man. The photograph above, taken in the 1940s, shows Charlie and Frank Allwood of Priory Farm in Thurgarton using a large tub and much elbow grease to wash their flock of 30 sheep. According to Brenda, Frank’s daughter, “it took them all morning and by the end they were exhausted, soaking wet and stank of sheep and disinfectant”. 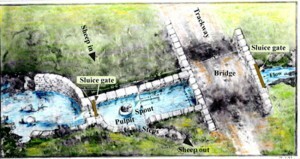 Sheep washing on a larger scale usually involved driving the flock through a fenced off section of running water. Many parishes had a traditional site for sheep washing, most were on local rivers or pools but some villages used the mill pond or even a suitable stretch of a seaside beach. The men would spend hours waist high in cold water and each animal had to be totally immersed and scrubbed; not surprisingly sheep washing was not popular with the men although apparently much enjoyed by spectators who eagerly anticipated accidental dunkings or watery chases. Many modifications were employed to keep the men relatively dry. 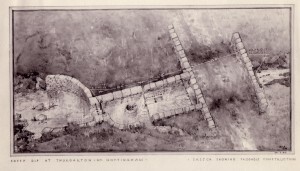 Some used raised wooden walkways or stone parapets which enabled the men to control and wash the sheep below with long handled crooks and brushes. An alternative approach was a central pulpit-like structure in the water in which a man could stand without getting soaked. 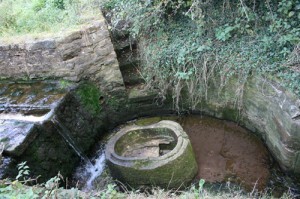 This method was used in Epperstone, the parish west of Thurgarton. 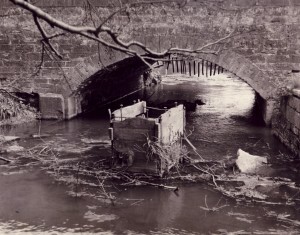 The photograph below, taken in the late 1940s, shows the remains of a wooden ‘pulpit’ in the centre of a stream immediately below a bridge. 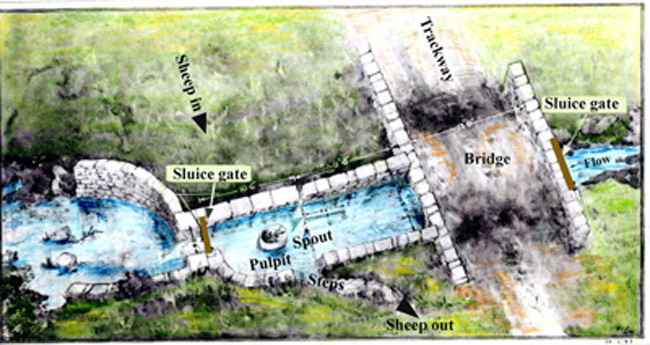 The pulpit could accommodate one man and was sufficiently tall and water tight to keep him dry as he washed the sheep which were driven past him through the stream. Thurgarton’s sheep wash was based on this model but was stone built and had a number of technical improvements. When we first moved to Thurgarton we were proudly informed that it possessed the second oldest sheepwash bridge in England; admittedly a modest boast but a safe one for who would bother to compete for such an honour. 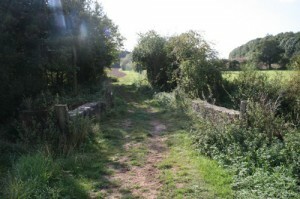 The bridge carries an old trackway over a small stream, the Thurgarton Beck or Dumble, a mile to the north of the village. In the mid 1940s the Boots Pure Drug Company purchased the Thurgarton Priory Estate for an agricultural research centre headed by Sir Jack Drummond He took a great interest in the history of the parish including the sheepwash and in May 1948 wrote the following letter to Country Life. 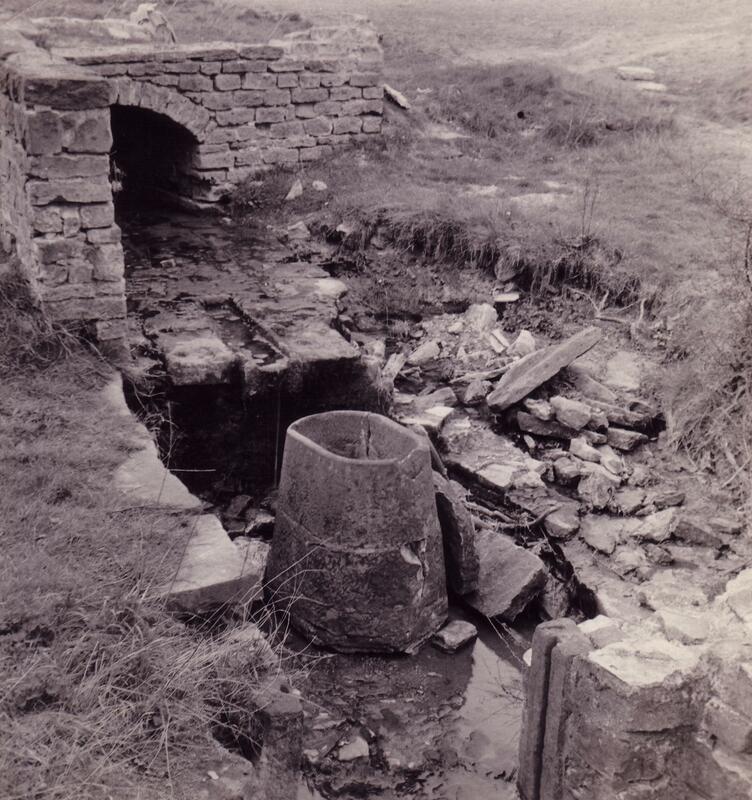 The local resident referred to in the letter was Bill Atkins a local farm labourer who remembered the sheepwash being used in his youth by farmers from the surrounding parishes of Halloughton, Gonalston and Lowdham. So began an early exercise in industrial archaeology and restoration; the sheepwash was in a sorry state as witnessed by photographs taken before reconstruction. Views of sheep wash bridge, Thurgarton in 1948 before restoration. 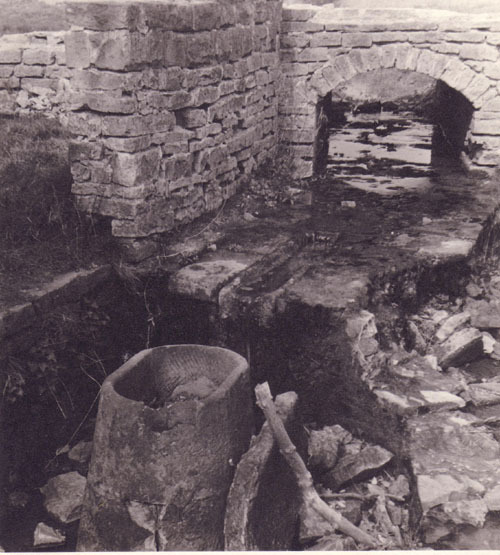 Further evidence for the date of the sheepwash was uncovered in the pages of the Journal of the Royal Agricultural Society of England of 1875 (Vol 2 page 330) where a note from Mr Milward of Thurgarton reported that “spout-washing was established at Thurgarton at the end of the last century and in combination with a wooden T-like instrument to work the sheep’s back”. The sheepwash was evidently in use in the late 18th century and from the archaeologists opinion recorded in Sir Jack’s letter may have originated in the mid-17th century. So what of Thurgarton’s boast that it possesses the second oldest sheep wash bridge in England? Maybe we should be cautious but I see no reason to change our proud claim – unless someone out there knows better. The bridge is beginning to deteriorate. The top half of the pulpit is missing and brambles and bushes are invading the basin but it remains one of the parish’s favourite features lying half way around a 3 mile circular walk from the village. — or you could just enjoy the scene. Well worth undertaking circular walk from the village to view. Very interesting and the map and photos are great. It makes you wonder how many more things in Thurgarton you walk past without realising what they were. I look forward to finding out! If you walk to it via the Hill Farm path on a very clear day you can get a sense of ‘sublime-to-ridiculous’ by comparing our lowly sheep dip (in the hollow) with Lincoln Cathedral and Belvoir Castle (both on the horizon)from the top of the hill! This was a totally new thing to us. It shows how ingenious our forebears were! Very interesting and amusing too. As a sheepwash I found this interesting. Very interesting read after seeing them on an old historical map.